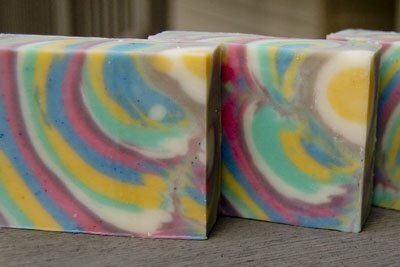 Producing a column swirl soap recipe has been on my 'to do' list for some time now and I'm happy to say that I thoroughly enjoyed making this one. 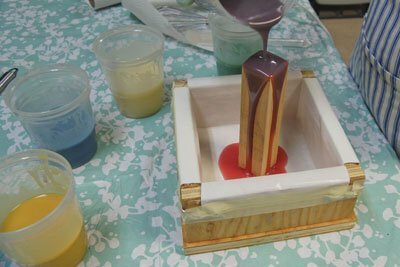 This design is easy to create by using a simple tool, a plain square column of wood, and lots of wonderfully bright, fun soap colours. With this batch I used 6 colours. Next time I will only use 4...I think it will have more impact. The recipe below is without fragrance but you are welcome to add whatever scent suits your fancy. Just be sure that the scent is a slow mover since this technique takes some time to achieve. I also did not discount the water, again because it would give me more time to work with the soap. Lye - 129.15 gr. | 4.6 oz. White Mica - 1/4 - 1/2 tsp. Green soap colour - 1/4 - 1/2 tsp. Purple soap colour - 1/4 - 1/2 tsp. Pink soap colour - 1/4 - 1/2 tsp. For this recipe I used the Room Temperature Method. 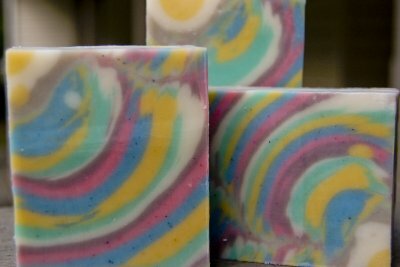 Begin making the column swirl soap recipe by bringing the soap base to a thin trace. 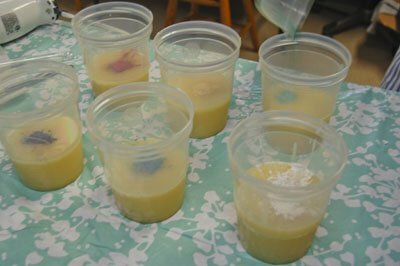 Divide the soap up into 6 equal portions. 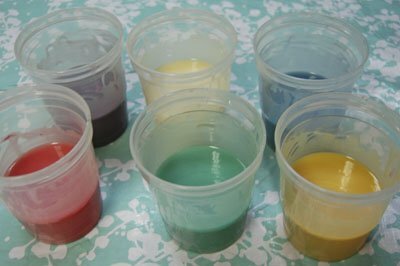 Add your colourants to each container. 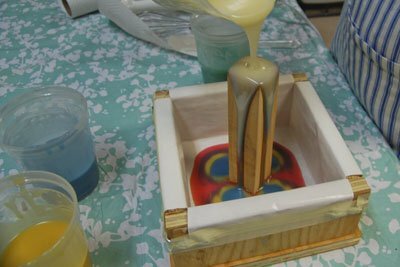 I suggest mixing the oxides and mica with a small bit of oil before adding it to the soap base. I got lazy and paid the price with little spots of unmixed colour throughout the soap. Mix in the colour with a small whisk or use a milk frother. 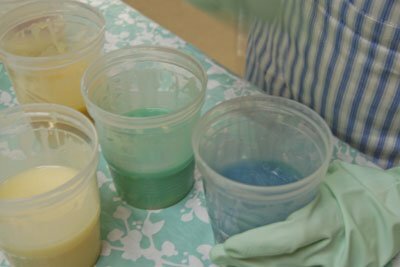 Make sure the soap colour is well mixed in with no lumps. This is important! I thought I had all of the lumps out but as you can see...there are a few still in there. 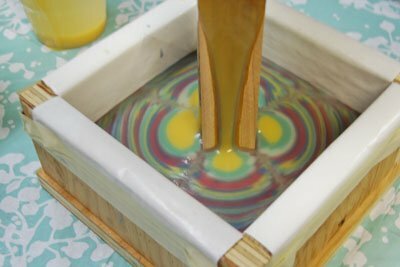 I love how this column swirl soap recipe uses such high tech equipment! 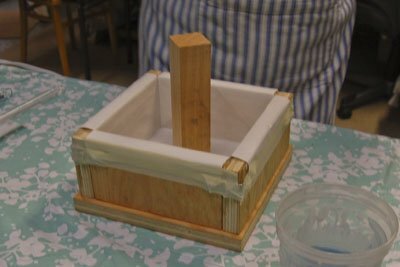 Place the square wooden column into the centre of the soap mould. 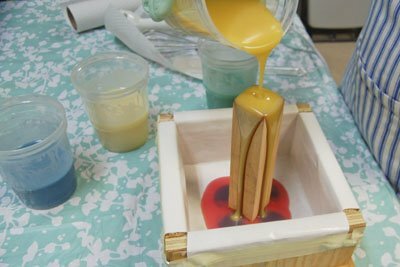 Start pouring the first colour of soap. 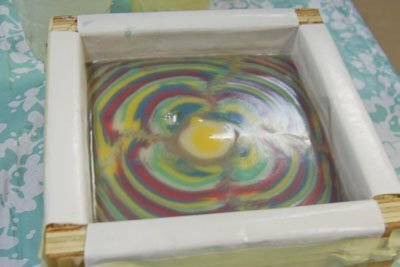 The amount of soap you pour will determine how wide the soap rings are. 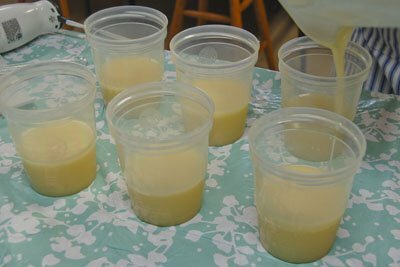 I went with pouring little amounts and wish I had used more soap base with each pouring. The wider rings look more vibrant and didn't muddy up like the narrower rings tended to. Alternate pouring the colours, being sure to put complimentary colours next to each other. It is best to avoid putting colours like pink and green next to each other since the result ends up some shade of grey. 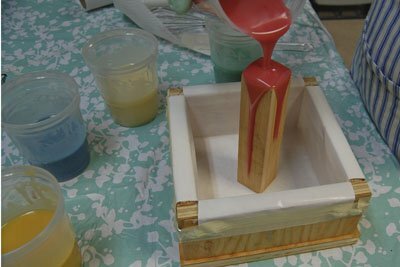 Once all of the soap base has been used up, remove the wooden column. I do not suggest scraping the column...which I did, since it results in a grey blob in the centre of the soap. If you get some grey in the centre, just cover it with some coloured soap if you have any left. Wrap the column swirl soap up and leave to insulate for 24 hours (or more...mine took a bit longer than normal this time...36 hours) and cut when it is firm enough to handle.